With the recent fad of truly wireless bluetooth headphones, there’s a few options you have when shopping around. Today, we’re reviewing the Allimity True Wireless Earbuds. There’s no cord connecting the two earbuds together, so the only time you need a cord is when you use the Y-adapter charging cable, which plugs into a USB port and has dual micro-USB plugs so you can charge both earbuds at the same time. The design is similar to a lot of other sport heaphones, with an over-the-ear hook that is made of an anti-slip material. The hook is thick, but it still fits well with a pair of sunglasses. 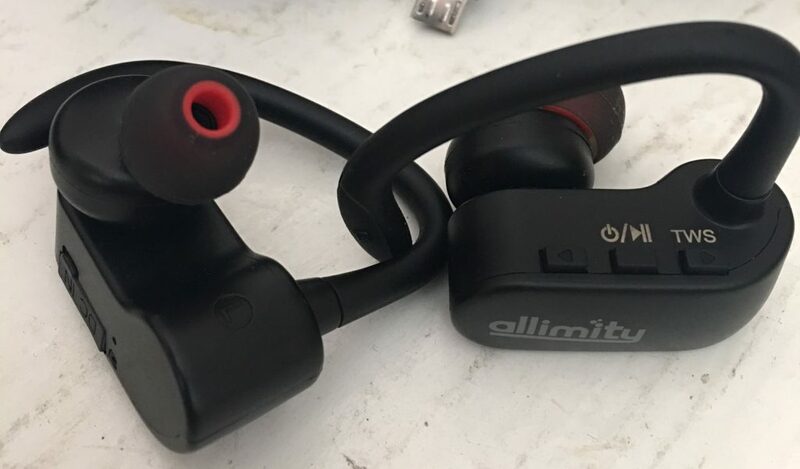 The Allimity True Wireless Earbuds are also sweat proof and water-resistant. You can get about 7 hours of playback time with the earbuds, which isn’t the best or worst when it comes to bluetooth headphones. Each earbud has its own battery, so you’ll want to make sure you have the Y-adapter cable to charge them both. Pairing the headphones is a little tedious because you have to pair them separately. When you turn them on, your phone will be connecting to a left and right earbud. I’ve reviewing similar truly wireless headphones where they pair with each other and you only have to pair one to your phone. On the plus side, you can also pair these to an Apple Watch without an issue. The sound quality is decent. You’re not going to get the quality that you would see from a high end brand, but for this price range you’ll get decent bass and a well-balanced sound. The biggest issue I had was with the bluetooth connectivity in a heavily populated city. While having my phone in my pocket and walking in downtown Chicago, the audio connection would drop on occasion and it usually dropped in one ear slowly, then the other ear, then the song would fade back in. I’ve had this struggle with other bluetooth headphones, but some perform better than others. Buy the Allimity True Wireless Earbuds now on Amazon for $47.99 with Amazon Prime! The battery life is actually quite nice. I get about a couple of hours of playback from my X2Ts.